So I mentioned yesterday that I'm working on a couple recipes. The first was the cheesecake one, which I tried out today. I think the peach could be a bit stronger, perhaps add in 2 peaches next time, and the balsamic syrup definitely highlights the fruitiness of the dessert. The syrup is more subtle than I thought it would be. 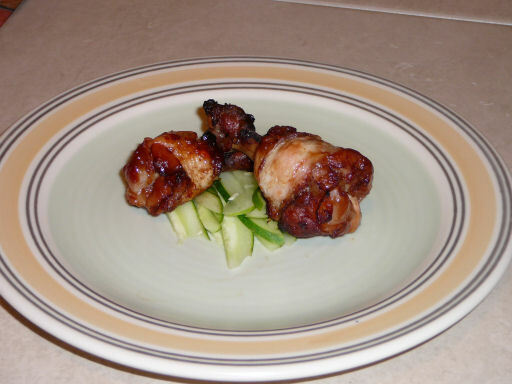 Second recipe- hoisin ginger marinated chicken drummettes. 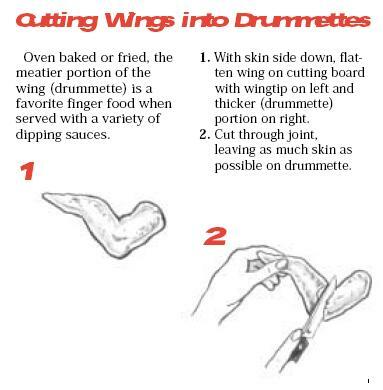 Drummettes are a modification of chicken wings, where you cut off the wing up to the first joint, and then fold the remaining skin and meat down over the bottom to form a miniature drumstick. To snip the chicken wings, you need a sharp pair of kitchen shears, and/or a paring knife/flexible boning knife. I prefer the Wusthof Classic or Henckels Pro S line, but these are wickedly sharp, so be careful. 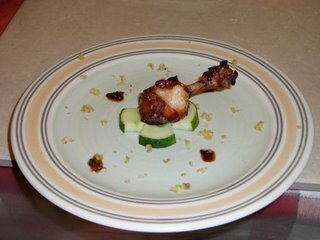 So I prepared about a dozen drummettes (save the remaining wingtips for chicken stock), and marinated them overnight in a Chinese flavored marinade. Quite similar to a dipping sauce for my dumplings. I admit I don't have any real quantities of ingredients for the sauce- just throw them together and mix to taste. Hoisin is very strong and thick, so don't use too much. It's kind of a cheap, but effective way of making a marinade. To go with the drummettes, I'll saute some Chinese eggplant, and use a cucumber as a garnish for the ensemble. I also made a Honey Dijon Mustard marinade for some other chicken drumsticks (it's an all chicken menu!) because the drummettes are small and few, and will only be appetizers. I'll use the drumsticks and coat them in Panko breadcrumbs before baking, for a healthier 'fried chicken'. 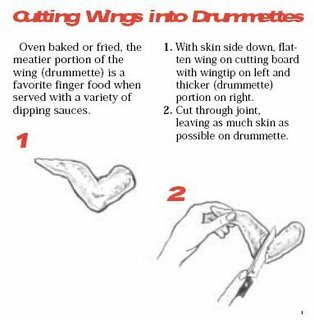 I was browing the web, and I found this helpful diagram about making drummette's. I think it was from Foster's (a meat manufacturer) webpage. 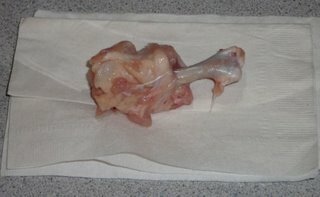 And here is my self-made drummette for comparison. Marinated overnight in the sauce, about to bake shortly this afternoon.Here's the final result. Taste is excellent, sweet and tangy. However, I need to improve the presentation. The ginger confetti is ok, but chunky at times, and the cucumber cup looks awkwardly cut (must get that channel knife!). The above presentation is too ugly and too symmetrical. I also need a smaller plate if it's going to be an appetizer. Changed it somewhat below.